We are constructor of Medical Waste Treatment Centers of Bahrain and Muscat (Oman). Jeddah Hazardous Waste Centre (Saudi Arabia), Medina Medical Waste Treatment Centre (Saudi Arabia) and Al-Ain Medical Waste Treatment Centre (U.A.E) are our latest realizations for hospital waste treatment and many others installations which respect all new European norms about atmospheric shoots. The complete destruction of waste from healthcare by high temperature incineration, respecting The European incineration standard Directive EU 76/2000. Infectious waste: laboratory cultures, waste from isolation wards, excreta, materials in contact with infected patient, waste suspected to contain pathogens. Pathological waste: body parts, blood, fetuses, other body fluids, human tissues. Sharps: needles, infusion sets, knives, blades, glass. Pharmaceutical waste: expire bottles, boxes. Chemical waste: laboratory reagents, disinfectants. Low-level radioactive waste: unused liquids from radiotherapy, glassware, absorbent paper, urine. Materials used to prepare anti-cancer chemotherapy. Out of date drugs and medicaments. Waste from non-conventional transmissible agents (Bovine spongiform encephalopathy). Solid waste such as plastic (including PVC), rubber, boards, wood, paint. Animal carcass is defined as all kinds of animal waste generated from farms, slaughterhouses, test laboratories, veterinary hospitals, zoos and others, also as pathological waste. ATI environnement (classification world health organization who) is the only one able to eliminate some typologies of hospital waste. Clean technology to ensure the elimination of your waste without any atmospheric pollution and respecting European emission standards EC76/2000. Reliability of the know-how with 3000 installations through the World. Fully automatic cycle, which does not require the presence of Employee. Mobile Incinerators in container for hospital, animal and industrial waste. 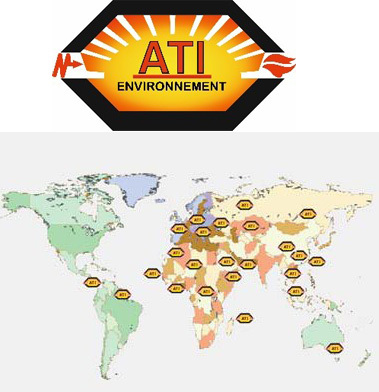 With a 80-year track record, the ATI ENVIRONNEMENT Company is fully confident in its technology that is based on strong R & D and innovative products catering for over 3000 customers world-wide. The latest ATI incinerators (classification World Health Organization – WHO) are the only systems able to eliminated some highly infective IMWs which other processes cannot destroy. ATI ENVIRONNEMENT undertakes into sustainable development by proposing installation with renewable energy to generate steam, hot water, thermal oil or electricity. Our filtration systems guarantee an installation with new European Emission Standards, the most severe in the world – Directive CE 76/2000. 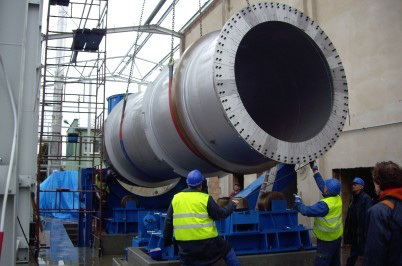 A range of rotary kiln with a capacity of destruction from 600 to 3000 kg / hour and thermal power from 2500 to 12000 kW per hour. 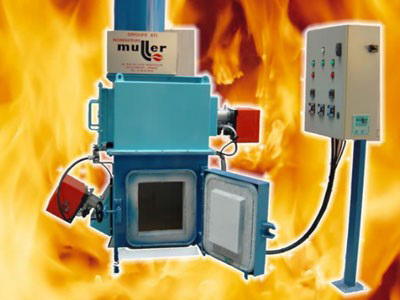 A clean technology permitting a continuous movement of the primary combustion chamber. 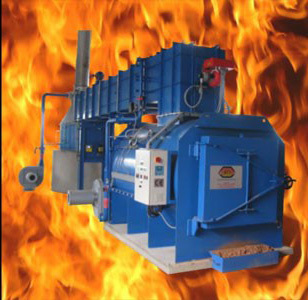 It guarantees a perfect combustion thanks to a permanent turning and mixing of the waste, so that the mixture is continually homogenized. Guarantee a optimal elimination regardless of moisture level, composition or compactness of waste. Parsian Medical is exclusive agent of ATI ENVIRONNEMENT since 2008. If You Have Any Question About Hospital Waste Incinerator Please Ask Us.